Even though it’s been the longest week ever, it’s finishing out with a really fun Friday! We are having our first company picnic today (I was in charge of getting yard games and renting an ice cream truck! ), and tonight I’m going with some friends to the Social Science event at the Perot (the science museum in Dallas). I’m really excited, I haven’ t been to the Perot before and now I’ll be able to cross it off my list! One – I bought this black lace dress from Francesca’s while I was in St. Louis and I am obsessed. I had tried it on before and thought about getting it, and I’m glad that I finally did! I plan on wearing it to a wedding later this year! Two – The 2016-2017 Lilly Pulitzer planners are now available! I’ve had lots of different brands of planners over the years, but I really loved my Lilly one a lot. Maybe even the most. I had the smallest size, and it was perfect to tote around in my purse and check my calendar! Four – I’ve been listening to Ben Rector a lot lately (always a good choice) and I hate that this song isn’t on Spotify, because it’s my favorite! Five – This recipe for brown sugar baked peaches looks so delicious and perfect for summer! 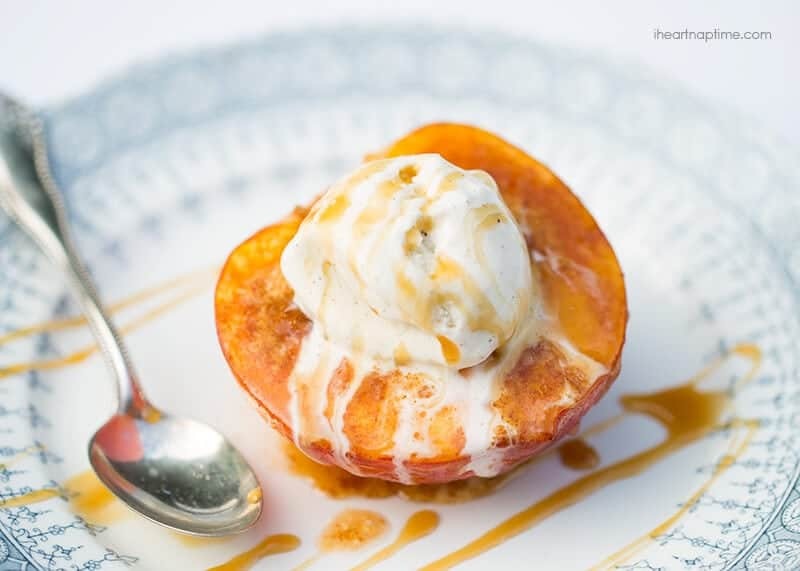 I’ve had grilled peaches with ice cream before, but since I don’t have a grill, I’ll have to give this baked version a try. With ice cream, of course. Lots of ice cream. And now I want to go eat something with ice cream. Oh wait, there will be ice cream at the picnic- problem solved!! I hope that you all have a fantastic weekend and don’t get too hot- it’s going to be a scorcher! It’s just so good and happy- I’ll dance with G when I come visit!